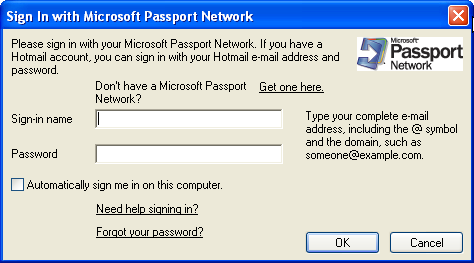 Message appears while browsing for print files in PTPublisher "Sign In with Microsoft Passport Network"
The message below appears when accessing the user folder while in thumbnail view. Microsoft Office 2003 installs a hidden folder and a link to "My Web Sites on MSN". Simply delete this link and the problem will be solved. Use the instructions below. 1. Make sure you set Windows view options to "Show Hidden Files". 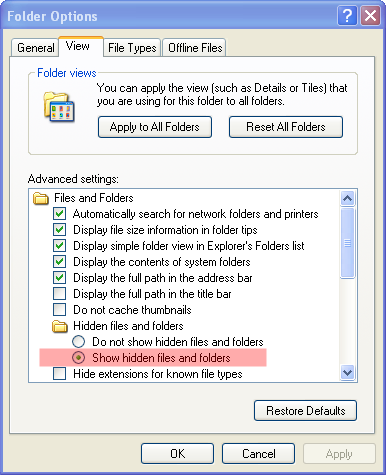 To set Windows to show hidden files go to the Tools menu in any Windows Explorer window. Choose "Folder Options". Go to the View tab. Select "Show hidden files and folders". The "NetHood" folder is a hidden folder. <username> represents the name of the user you are currently logged in as. 3. Delete the "My Web Sites on MSN" shortcut.